Given the reputational damage suffered by the big four Australian banks throughout the Banking Royal Commission hearings, many bank customers and investors are looking for alternatives. Whilst still in its infancy, Australia’s banking and credit start-up sector has grown leaps and bounds in recent years, with Afterpay Touch Group (ASX:APT) being a high-profile example. Although the “buy-now, pay-later” (BNPL) sector has received most of the media coverage, the development of so-called “neo-banks” has also started to gain momentum. Neo-banks are best described as traditional banks without a bricks-and-mortar presence, with their entire offering supplied through digital means. They are fully functioning deposit-taking institutions and therefore fall under the supervision of the Australian Prudential Regulation Authority (APRA), which must provide a license before they can accept customer deposits. The main players (listed and unlisted) across the BNPL and neo-bank sectors can be seen in the table below. The main premise of the BNPL sector is that it replaces the now outdated interest-free financing that was provided when products were purchased in-store. A customer goes to check out (either in-store or online), where they are given the option to pay with credit/debit card or cash, or through a buy-now, pay-later company (provided they are affiliated with the business). If that last option is chosen, the product is paid for by the BNPL company, which then establishes a repayment schedule with the customer. This repayment schedule is normally interest-free, but customers can incur late fees if payments are missed. The merchant also gets charged a fee as a percentage of the sale price. Afterpay Touch has been the big success story of the BNPL sector (and the ASX more generally), with its share price rising from A$1.00 at IPO to over A$15 currently. This has been on the back of a huge uptake of the service by Australian millennials, with an estimated one-in-four using the service and 2.5m individual customers transacting with the service. APT has also had a successful launch in the US, with A$260m worth of sales occurring in the US (out of total sales of A$2.2bn in 2018) and growing faster than most brokers expected. Goldman Sachs has a price target of A$19.25/share for APT; Bell Potter’s price target is higher at over A$25. APT’s main competitor is Zip Co (ASX:Z1P), which provides a slightly different product but still acts in the BNPL market. Zip is keen to differentiate its business model from APT’s. 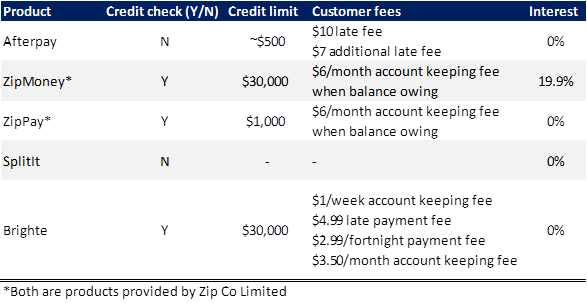 The main difference stems from Zip’s use of credit checks on prospective customers, which APT does not do. Also Zip extends a line of credit from which purchases are deducted from a total limit, while APT charges based on a purchase-by-purchase basis. Zip has also performed well since listing, with an IPO price of A$0.20 compared to around A$1.17 now. Both companies have been recently called to present at a Senate enquiry into the BNPL sector. There is the potential for such BNPL businesses to be classified as credit providers and therefore subject to regulation. Currently, both Zip and APT are excluded from regulatory oversight as they do not charge interest, so their product is not classified as credit. Such regulation would have a negative effect on their business models, particularly for APT which does not perform credit checks. APT has argued that because its average loan size is c.$150 and without interest charge, it is distinct from traditional forms of credit. It also draws a significantly lower portion of its revenue from customer fees (about 20%), compared to Zip at around 60%. Besides those two main players, there is a raft of other participants with slightly different business models. Two of the more interesting examples are Splitit and Brighte. Splitit, a potential ASX IPO for early 2019, allows consumers to borrow against their credit card limits, and then repay in up to 36 monthly payments. Brighte was set up to allow customers to purchase just solar panels, batteries and home appliances, and then enters customers into zero-interest repayment schedules. Some of the differences can be seen in the table below. For neo-banks, this Tuesday marked a milestone in Australia for the sector, with Volt Bank receiving an unrestricted banking license from APRA. This is the first such bank of its kind that will now try to compete with the big four banks for customer money. Volt expects to start taking customer deposits in March 2019, provide home loans by the end of this year, and commence small business banking in early 2020. Other competitors making inroads towards getting full banking licenses include Xinja, which currently functions on a restricted license, and 86400 which expects to receive an unrestricted license in Q1 2019. 86400 is wholly owned by the payments-processing giant Cuscal and thus could use their banking license to start taking deposits, but has chosen not to. One Australian digital bank, Up, is already accepting customer deposits by using the banking license of Bendigo & Adelaide Bank (which must hold regulatory capital against Up’s lending). The big four banks have considered launching their own digital bank offerings in reaction to the growth of neo-banks, but only NAB’s UBank exists currently. However, the threat to the big four banks should not be exaggerated. They have the advantage of a lower cost of funds and are investing significant amounts in upgrading their mainstream digital offerings. That said, the reputational damage to the big four is creating opportunities for alternatives providers. Globally, the rise of neo-banks has been rapid, particularly in countries where faith in the banking system is relatively low (e.g. Italy, France). Revolut (the first neo-bank to claim to be break-even on a monthly basis) has gained traction in its local market (the UK) and is looking to enter the Australian market in the not-too-distant future. However, a recent study found that more than 60% of Australians still have faith in the current banking system, compared to less than 40% in Italy and France, meaning that uptake in new products here may be slower than overseas. Looking forward, regulation for BNPL providers appears unlikely in the view of most analysts, especially in APT’s case given the differences in its business model. However, given that one-in-six people report having been in some sort of debt stress because of BNPL, it does suggest that there may be certain measures that need to be put in place to limit potential negative effects. That said, the astronomical growth of this sector is likely to continue as uptake increases. On the neo-bank front, the majority are still moving toward getting lending licenses from APRA, but most are still a fair way off. The big four banks will be hoping that their scale advantages and recent investment in upgrading existing digital offerings will help them meet the challenge. This article is prepared by Mason Stevens Limited (Mason Stevens) ABN 91 141 447 207 AFSL 351578 and is general advice only and does not take into consideration yours or your client’s personal objectives, financial circumstances or needs and should not be relied upon as personal advice. You should consider this information, along with all of your other investments and strategies when assessing the appropriateness of the information to your individual circumstances. Securities, by nature, rise and fall and as a result investing in securities including derivatives involves risk. Past performance is not a reliable indicator of future performance and may not be achieved in the future. Mason Stevens and its associates and their respective directors and other staff each declare that they may hold interests in securities and/or earn fees or other benefits from transactions arising as a result of information contained in this article. having experienced the frustrations of trying to fix problems when dealing with companies that are purely on-line, there is just no way that I would ever consider putting my bank balance in the hands of an on-line business with no bricks and mortar presence particularly from overseas . reckon most Aussies would feel the same. as for people who have "lost faith" in banks, they are deluded if they think that neo- banks can't have the same issues as normal banks. Neobanks should be very successful as brick and mortar is not necessary and the banks are stuck in 1995 technologically and operationally. They won't be though as they are poorly run. Just look at Up and their ridiculous deposit limit. They don't understand their target market and will therefore fail. BNPLs and Neo Banks choose a market segment and aim to do it very well by creating a product that is "fit for purpose". Traditional banks adopt a "one size fits all" and do it average (to sometimes poor). The challenge for the BNPLs and Neo Banks will be attaining an economy of scale that provides a suitable return to investors. I'm aware of other BNPLs, like Artmoney Pty Ltd (unlisted), which is very niche, has an Australian Credit Licence and has expanded overseas to exploit a global market opportunity. I would have thought Members Equity bank was a neobank. I wonder what would the future hold for these companies as you can start hearing already concerns around easy spending, easy money, youth debt ,etc. They enjoy zero to minimal regulation at the moment but this might change severely in the future.